We specialize in high end decorative concrete and architectural hardscape. We have worked hard to perfect the integration of concrete into landscape designs. These architectural elements add character and depth to both commercial and residential design. A beautiful solution to finished concrete floors is concrete staining. Decorative stained concrete can be applied as a indoor concrete stain for interiors or as an outdoor concrete stain for patios and pool decks. We specialize in high end custom concrete design and installation. We have collaborated with many homeowners and designers to bring one of a kind custom concrete installations into reality. A concrete skim coat also know as microtopping can transform any space into a beautiful contemporary masterpiece. It can be applied directly over a wide variety of surfaces, wood, tile, or existing concrete. Concrete polishing can add a beautiful aesthetic to any space. We have 20 years of experience polishing concrete, which ensures that the floor you get is done professionally and correctly. A properly honed concrete floor will bring out the natural beauty that resides in the concrete itself. Our work speaks for itself, if you have spent any time browsing this site or seen our work in person, you can not deny the sheer quality and attention to detail that we pride ourselves on. We strive to take care of our client from the initial phone call to finished project. We spend the necessary time before a project is even considered to make sure our clients are educated on the processes. One unique aspect of our company is that we are the only company in the industry that has two divisions; architectural hardscape and all types of decorative concrete. 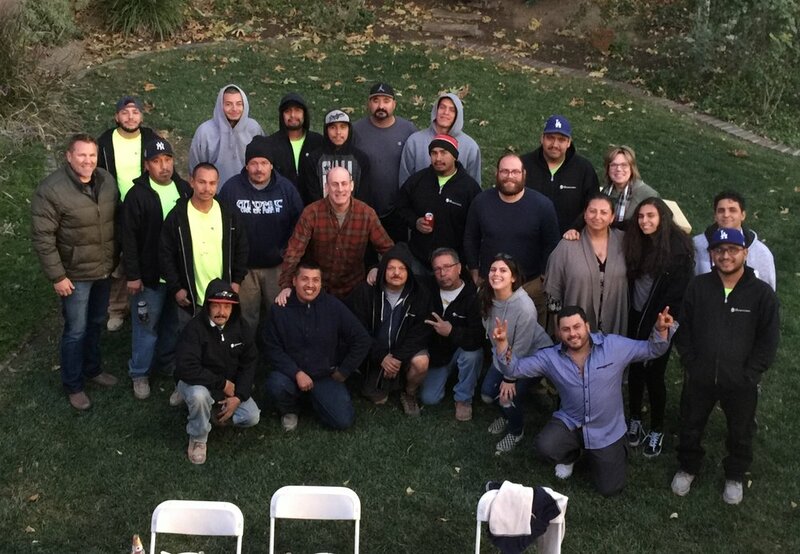 All of our work is done by our own in house crews, most of which have been associated with us for over 15 years. This ensures that we are able to deliver the best end product to you with the most control over the overall process. One of the many process of refinishing concrete is a microtopping. We have become experts in this process with experience in excess of 20 years. "What does remodel with out removal mean?" Our microtopping process has the ability to be applied over many types of surfaces such as finished wood, plywood, tile, vinyl flooring, glass, and existing concrete floors. This process does not involve any demo work therefore saving the end user both the time, money, and hassle of removing the existing flooring. One aspect/advantage to this process is there is no issue with added weight, allowing this product to be applied on upper stories of buildings with out structural concerns. Additionally because the added thickness from the material is so minimal there is no issues with transitions between rooms and other flooring types. 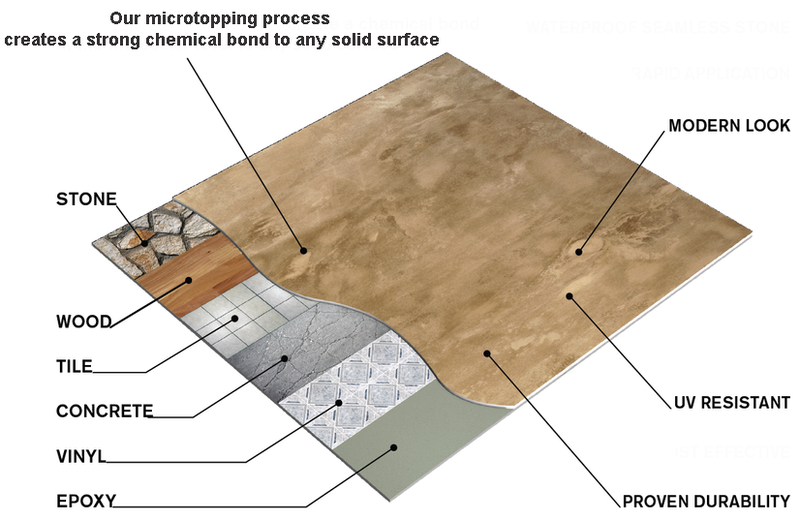 Depending on the condition of the existing floor there can be up to 10 different steps involved in the process of applying a microtopping. The most important part is what we call a "scratch coat" which is the initial layer applied to bind our product to your floor. Depending on the condition of the existing flooring an optional layer called a semi-rigid/crack membrane can be applied overtop of the scratch coat to help alleviate the natural stresses that are transferred through from the underlayment. The next step of the process is to apply 2-3 layers of base coats followed by finish coats. After the final finish coat has been applied then the entire floor is cleaned, stained to your desired color(s), sealed and waxed.